Happy Monday! I hope everyone had a great weekend! 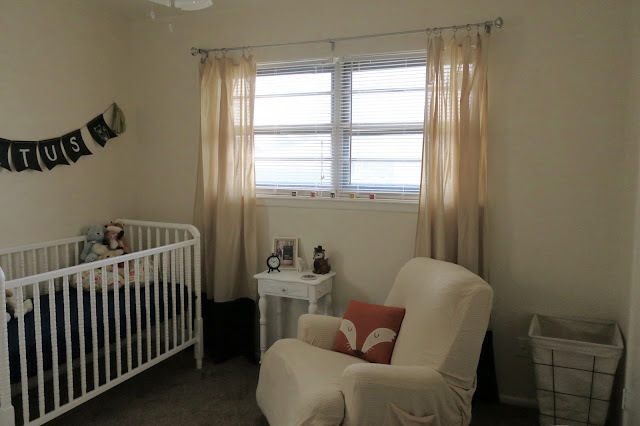 Ryan and I had a super fun and productive one - we finally finished every detail of Titus' nursery! And I am so excited to share it with you. The first thing you see is the diaper wreath made by Titus' Libby (my mom). We love everything about it, it truly sums up his room as a whole! On the wall to the right are his bookshelves and closet. I also have his rock'n'play on that wall but it will move around the house once he's here! Eventually I'd like to have a few oversized pillows on the floor under the shelves to create a little reading area! Next, I want to turn your attention to the recliner. This is a piece of furniture I've had for about the last four years, originally given to me as a hand me down from my parents, who it was given to by my grandparents. It is a La-Z-Boy, it rocks, swivels and has a footrest that pops up. This thing is in excellent condition for it's age (and so comfortable) which is why we decided to use it in this room. Not to mention we saved ourselves a couple hundred bucks by using a piece we already had! It is a dingy blue color (from years of wear and tear) so we just threw a cover on it to brighten it up and called it good! Here is his sweet crib filled with so many precious stuffed animals (yes I will remove them when he starts sleeping there), a name banner from one of my showers made by my bestie Jessica, and you can see our birth bag and diaper bag over on the left! Here you can see the curtains again, I just love them so much! And here is the dresser we ended up with - gifted to us by our sweet Grandma Maria (Titus' great grandma). I have the Burt's Bees changing pad cover in blueberry, the Dekor diaper pail, the OXO Tot wipe dispenser, a wire basket to store diapers, a classic favorite book and a sweet pair of shoes that were a gift. Above the dresser is a chalkboard I made, a metal 'T' and two sonogram photos. I will eventually switch those out for pictures of his sweet face! This photo shows the rug we decided on. It just covers the area right in front of the dresser and I love it! I had originally picked out something much bigger that was red and white. And I love that rug, but it was too big and just didn't work in this little room once we had everything in place. It's definitely a great rug though so we'll be saving it for a future bedroom or play room! And in this corner I have three stackable wooden bins. We've got have extra diapers there for now but I envision them to be toy bins one day, maybe for a future play room! Love them! You probably notice an empty space on the wall! My mom is bringing something for that spot when she comes for the birth. I'm excited to see how it works there! For context, our bedroom is just across the hall - which is super convenient. And because nothing is complete without this pup - here's a sweet photo. He loves this room (I find him laying in here alone from time to time) and I just know he will do great when little boy does finally arrive! I tried to link as many things as possible but if you have any questions about where things came from, feel free to find me on any of my social media accounts or shoot me an email! Also, there are a ton of things in this room that were gifts - so if you gave us something in here, thank you!! We could not have completed this space without so many thoughtful gifts from friends and family. I truly love how this room turned out. My vision for it evolved over the months we worked on it, shopped for it, added things and took things away! But my biggest goal was for it to be light, bright and welcoming and I think we accomplished that! Thank you to my sweet, precious husband who painted the room, built all the furniture, helped me hang shelves and frames, etc. You are already dad of the year in my eyes, boo!